MetService meteorologists say the broad low which delivered severe weather to New South Wales earlier this week is now moving eastwards over the Tasman Sea. The low is expected to approach the North Island on Thursday, then move a front southeast over the country from Friday through to Sunday. This front is forecast to spread northeasterlies and rain over much of New Zealand, with the heaviest falls expected about northern parts of both islands. MetService meteorologist Andy Best comments, “We may see heavy rain reaching warning amounts during Friday and Saturday for Northland and Auckland as well as for Waikato, western parts of Taupo and Nelson although meteorologists are keeping a close eye on these areas. Heavy rain is likely to reach warning amounts during Saturday and Sunday for Coromandel Peninsula, Rotorua and Bay of Plenty. Northeasterlies and rain ease over the country late Sunday to Monday, but showers persist in many places, some may be heavy with isolated thunderstorms. 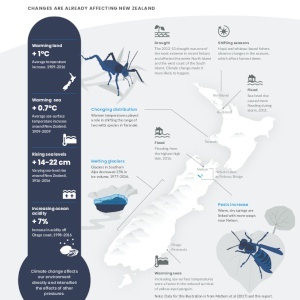 This is a developing system and people need to stay aware of any Severe Weather Watches and Warnings which may be issued by MetService in the next few days. However, it’s not all doom and gloom, much of the South Island will have a weekend of mostly fine weather, apart from afternoon showers, although humid northeasterlies along the east coast deliver low cloud and drizzly rain there during Friday and Saturday but easing Sunday.